The Royal Motor Yacht Club is proud to support Woman’s Rugby and looks forward to staging an event in the near future. The National Women's Rugby Sevens Championship is a national residential Championship for female players from state/territory and affiliate representative teams, conducted annually by Australian Rugby Union. 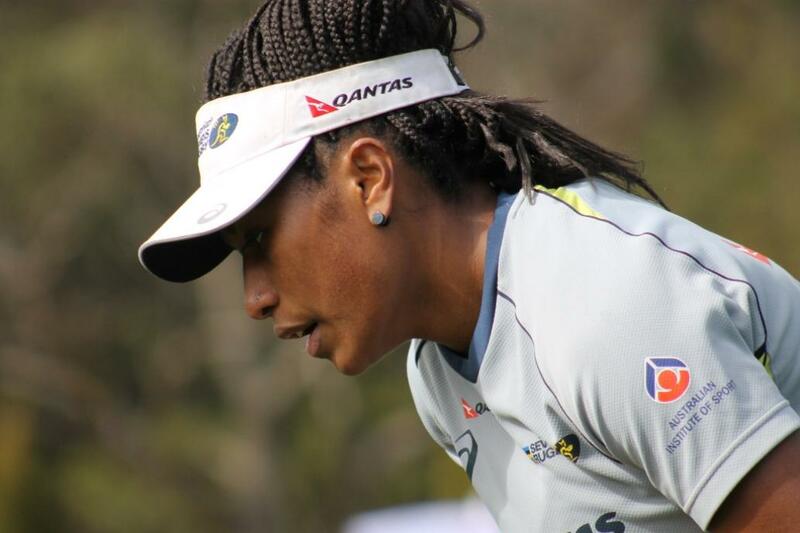 The Qantas Men’s and Women’s Sevens sides are showing real potential as they work towards Olympic qualification for the 2016 Games in Rio. Our Women’s side in particular has had an incredibly successful few months and now is second in the world rankings of the IRB Women’s Sevens World Series. In Glasgow, at the Commonwealth Games, the Australian men’s Sevens Team gained a Bronze behind South Africa (Gold) and New Zealand ( Silver) with over 180 000 people attending the four sessions. At the just finished Youth Olympics held in Nanjing, history was made when the first Olympic Rugby Gold medals for 90 years were awarded and Australia’s women’s team won every match they played and then rose above those standards to take the Gold. For the Games of the XXXI Olympiad in Rio 2016 there will be 12 Qualification Places for Men consisting of 11 teams plus one team from the Host Country and for Women another 11 teams with one team also coming from the Host Country. The teams ranked 1 to 4 in the final rankings of the 2014/15 IRB Women’s Sevens World Series will qualify directly a quota place for their NOC to the Rio 2016 Olympic Games. It is intended that the Series will consist of 6 tournaments and will commence in December 2014 and finish in May 2015. All 2015 IRB Regional Association Sevens Championships are intended take place between 1 June 2015 and 31 December 2015. So although the Women’s Seven’s has done really well, their place at Rio 2016 is not confirmed as yet. There’s a hard road ahead of them and more matches to be played that will see them travel to all corners of the earth and have to arrive fit enough to win. No easy task. The Qantas Australian Women’s Sevens team begins its quest for Olympic qualification in Rio with Dubai first up in the IRB Women’s Sevens World Series in December. Like last season, the series will conclude in the Netherlands as part of the Amsterdam Sevens. “We now have Canada and London added to the bill for the coming season and given the appetite for quality Rugby and the Sevens Game, I have no doubt that they will be excellent hosts when they welcome the women's series to their shores next year." 12 teams will take part in each round of the IRB Women’s Sevens World Series. Seven teams have qualified as core teams from last season’s series. Hong Kong will host a qualifying competition in September that will see an extra four teams qualify. The 12th team will be invited for each round of the series. Australia finished the 2013-14 IRB Women’s Sevens World Series standings as runners-up, just four points behind New Zealand. Queenslander Emilee Cherry won the IRB Women’s Sevens Player of the Year. Two weeks ago we attended a training session for the QANTAS Woman’s Seven Squad at the Sydney Academy for Sport and Recreation at Narrabeen. These young ladies are all elite athletes who have a huge passion for rugby. Working hard at building and honing skills during the practice session is an indication of the grit and determination and commitment these women have to an elite sport that has been part of our nation from its earliest times. It’s a fast paced game with contact – we love the physicality of it. Especially in 7’s – there’s only seven people on the field and 14 minutes of play. So every minute is high intensity for every run and you get to show off what skills you have. It’s all of our dream to go to the Olympics and be included in the Rio 2016 Games. What Program are you working on to get to the 2016 Rio Olympics? Centralising here for training at Narrabeen in January was the first step; we contracted 20 girls as it’s now an Olympic funded Program and have our qualifying season coming up in the IRB circuit and there’s six stops there this year as well. If we come in the top four in that series we qualify for the Olympics. What is involved in the training sessions? We usually go to the gym for our strength programs, then train and then recovery in the ice baths. We do field sessions here working on our skills, which is focusing on the rugby side of this, and then a session on the track where we do speed and conditioning running. What is the best thing about training here at Narrabeen? You get to train with the other girls on the team every day so we get a good feel of how to work best together. There’s also great facilities, a pool for extra work, a gym and we’re all together everyday – it’s building great team spirit. We all live nearby so we’re a close-knit group. Is there a team motto? We have made a little ‘credit card’ which we all keep in our wallets; which is not just a few words but our philosophy on what we are training for and our morals – this encompasses little things like ’24 hour cameras’ – so this reminds you that everything you do at home and here should be approached with integrity – all the values we have here you should carry over to when you’re at home or when you’re by yourself . There’s also Unity with the team – we’re all one big family – that’s a really big focus for us- to be a team, not only on the field but also socialising together; to love the hard work and how that strengthens us as a team. The 31st Olympiad in Rio de Janeiro will be the first held in South America and will run from 5-21 August 2016. Getting to Rio is the dream of every athlete now working hard to try and win a place on the Australian Team. In order for them to be able to concentrate on what is required the support of coaches, family and our community, from the ground up, will be required. WE can all support our local girl's dream by treating our selves to a wonderful lunch overlooking glorious Pittwater and get to meet a few current and future legends into the bargain. Ellia Green - training at Sydney Academy of Sport, Narrabeen. Rugby 15s was played at four Olympic Games: 1900, 1908, 1920 and 1924. The following countries became Olympic Champions at rugby: France in 1900, Australia in 1908, USA in 1920 and 1924. The following countries won medals in the Olympics rugby tournaments: France - three medals: one gold and two silvers, USA - two gold medals, Britain - one silver and one bronze, Australia - one gold medal, Germany - silver in 1900 and Romania - bronze in 1924. Baron Pierre de Coubertin, the founder of the modern Olympic movement, played, refereed and promoted Football Rugby as it was called in his days. The Baron was 25 when he visited Rugby School for the first time in 1888. By that time de Coubertin had already read both the works of Thomas Arnold, Rugby’s great headmaster and educationalist, and Thomas Hughes’ novel, Tom Brown’s Schooldays. Arnold's essays and the fortunes of young Tom Brown made a great impression on the young French aristocrat, in search of educational models for his country, traumatised by defeat in the French-Prussian war. After his return from his first visit to England, de Coubertin became an active promoter of physical education in general and Rugby Football in particular, which he managed to introduce into several school establishments in Paris, securing the long term future of the Game in the country. He went on playing with his friends in Bois de Boulogne and although there is no information about his Rugby prowess, his knowledge of the Game was well respected by his peers, who elected him to referee the 1892 match between Stade Française and Racing Club de France – now regarded as the inaugural French championship. The French educationalist became one of France's leading promoters of sport in general and Rugby in particular, and as such he played a significant role in the formation of the Union des Sociétés Français de Sports Athlétiques (USFSA) and the development of Rugby in France. He was elected to the IRB Hall of Fame in 2007. The fact that no Rugby was played in Greece at the end of the 19th century may account for the absence of the Game from the inaugural Olympic Games in 1896, but in 1900 the Baron succeeded in gathering three teams for the first Olympic Rugby competition in Paris: a Parisian selection, representing France, Frankfurt FC representing Germany and Moseley Wanderers, a selection from Midland clubs – the UK representatives. France, captained by the legendary Frantz Reichel (one of de Coubertin’s friends), became the first Olympic Champions at Rugby by beating Frankfurt FC 27-17 and Moseley Wanderers 27-8 respectively. The match between Germany and Britain did not take place, because the English team, in the true amateur spirit of the day, having travelled to Paris the day before the match (on Saturday), had to return back home immediately after the match. There is a dispute over whether Rugby was an ‘official’ sport in the 1900 Olympics or not, following a subsequent attempt, to sift through the numerous sporting competitions of the 1900 Paris Universal Exhibition. Unlike other events or sports which were in retrospect denied Olympic status, Rugby Football, fulfilled all criteria of an Olympic competition: it was international, (three entries France, Great Britain and Germany), was played by amateurs, was not played by motorised means and involved no handicap of any kind. The 1908 Games, held in London brought Rugby back into the Olympic programme. In the Olympic programme, the number of Rugby teams was limited to four and the matches were scheduled to be played "in the stadium, about October 19, 1908. Prizes: Gold Olympic medals to the winning team." According to the official history of the 1908 Games, South Africa and New Zealand declined the invitation to play in the Olympics, while Ireland, Wales, and Scotland ignored the invitations. "That left England, France and Australia as the only competing teams. England were originally scheduled to meet France with the winners taking on Australia, but one week before the match France withdrew on the grounds that it could not raise a representative team and the two remaining teams, Australia, represented by a team selected from the touring Wallabies, and England, represented by the County Champions, Cornwall, met in the only match of the 1908 Games." The Wallabies demolished Cornwall 32-3 in a one-sided match. At the dinner hosted by then London RFU at which the Olympic medals were presented, the Wallaby captain, Dr Herbert Moran, replying to the toast given by Sir G Rowland Hill, the RFU President, said, "they were delighted with their reception, but deeply regretted that they had not in the Olympic Games met a side thoroughly representative of the United Kingdom. When they decided to enter they had hoped that they would conquer or be conquered by the best teams in the world..."
Olympic Rugby. England (Cornwall) v. Australia 1908 Gold Medal Match: Image No. : a512001. From John Corbett Davis Collection - courtesy State Library of NSW. Rugby was absent from the Olympic programme in 1912, but after the Great War, it re-emerged as an Olympic sport at the 1920 Games in Antwerp. The Home Unions did not take part, arguing that the event held in September was too early in the season to enable the British to compete on equal terms with the other teams. The Romanians and Czechoslovakia withdrew at the last moment, which left the USA, represented by a team of Californian students, and France as the only two competitors. The USA, coached by former Wallaby winger Daniel Carroll, at the time a student at Stanford University in California, surprised the French with the vigour of their game and the precision of their defensive work and won the match 8-0. Daniel Carroll became rugby’s first Olympic double gold medallist. The 1924 Olympic Rugby competition commenced on the opening day, May 4, with the match between hosts France, by that time seasoned Five Nations campaigners, and Romania, newcomers at international level and making their maiden Olympic appearance. Not unexpectedly, the French dispatched the newcomers from Eastern Europe by a record margin of 61 points to 3 – according to some sources the score was actually 59-3 – scoring a record 13 tries in the process. The walkover win must have given the French players and public a sense of invincibility and high expectations, exacerbated by an intense and partisan media campaign. On the following Sunday, May 11, the US team comprehensively defeated Romania, at Stade Colombes, though the Romanians defended gamely and managed to limit the score to 39-0, with the Americans scoring only eight tries. The defeat ended Romania’s campaign in the Olympics, but secured them the bronze, their first-ever Olympic medal. The Olympic final was played at the same Stade Colombes in Paris on May 18, before a strongly partisan crowd of about 50,000. The Americans surprised their hosts and the crowd with their pace, skill and tackling and won 17-3 scoring five tries to France’s solitary effort. In 1925, Baron de Coubertin stepped down as the President of the IOC and his successor, Count Baillet-Latour, did not share the enthusiasm of the founder for Rugby Football. The 1925 Olympic Congress, at which Baillet-Latour was elected as the second IOC President, signalled the beginning of a drive against team sports and despite the vigorous protestations of the Dutch students keen to have Rugby in the programme of the 9th Olympic Games in Amsterdam, Rugby was dropped from the Olympic programme. The global development of rugby through the rapidly increasing number of Unions affiliated to the IRB and the explosion in participation and support for both the Fifteens and Sevens disciplines of the Game cannot be denied over the last 100 years. This rapid growth reflected growing awareness and support for rugby within the Olympic Movement, culminating in a recommendation in 2001 from the Olympic Programme Commission to the IOC Session, that Rugby Sevens be included in the Beijing 2008 Olympic Games. While the IRB had proposed the inclusion of either Rugby Sevens or Fifteens, it was the Olympic Programme Commission that recommended Rugby Sevens as it felt this fast-paced youthful version of the Game was best suited to the multi-sport environment, as has been proven by the huge success of Sevens in both the Commonwealth and Asian Games, where it is now a core sport. Unfortunately, the recommended modernisations to the programme were not carried through but that did not stop the IRB from carrying on in its quest for rugby’s inclusion in subsequent Games. Dr Syd Millar of Ireland, who succeeded Vernon Pugh as IRB Chairman, continued the campaign for Olympic admission with increased vigour. The IRB’s efforts reflected the global views of world rugby, leading to its inclusion in further IOC reviews for the London 2012 Olympic Games in 2005. Although rugby was short listed for consideration in the Olympic Programme, the IOC again decided not to introduce new sports and the goal of becoming an Olympic sport remained tantalisingly out of reach. The newly elected IRB Chairman, Bernard Lapasset of France, made the readmission of rugby into the sporting programme of the Olympic Games one of his top priorities. Following a concerted campaign by the IRB, Member Unions, Regional Associations and the global Rugby family, Rugby made the shortlist of potential sports for inclusion on the Summer Olympic Sports Programme. At the 121st IOC Session in Copenhagen in October 2009, IOC members voted overwhelmingly in favour of Rugby Sevens inclusion on the Olympic Games Sports Programme for 2016 and 2020, 81 votes in favour with only eight against. This historic achievement meant that the world's top Men’s and Women's Rugby players would now have the opportunity to compete for an Olympic Gold medal, the pinnacle of sporting achievement. Rugby Sevens has become increasingly popular around the world and is played at major Regional and Multi-Sport competitions including the Pan American Games, Asian Games, Pacific Games, Commonwealth Games, World Games, Universiade and, from 2015, the All African Games. The IRB strongly believes that Rugby Sevens will add value to the Olympic Games by attracting an engaged international audience, young and old, to a globally popular sport which embodies the Olympic ideals of friendship and fair play. The aspirations of the Rugby family to realise the original dream of the founder of the modern Olympics are set to be fulfilled. As early as the 1820s, there are reports of Rugby games being played at Barrack Square in the city between the army and the crews of visiting ships. Rugby Union formally began in Australia with the formation of the first clubs, the oldest of which is the Sydney University Club, formed in 1864. Rugby Union at Sydney University - 1 September 1934, Image No. : hood_00506, courtesy State Library of NSW. By 1874 there were enough clubs to form a Sydney Metropolitan competition and in that year the Southern Rugby Union was established. In 1892 the Southern Rugby Union of New South Wales and the Northern Rugby Union of Queensland (formed in 1883) became New South Wales and Queensland Rugby Unions respectively. Representatives from these two unions combined in 1899 when an Australian team played its first Test series - against a visiting team from the British Isles. Four tests were played, Australia winning the first test at the Sydney Cricket Ground 13-3. The second test in Brisbane and the third and fourth Sydney were won by the British Isles who took out the series. Without a national jersey, the Test matches in New South Wales were played in blue jerseys and in Queensland in maroon - both with the Australian Coat of Arms on their chests. In 1903 Australia and New Zealand played a single test at the Sydney Cricket Ground in front of a crowd of 30,000. This was the beginning of intense rugby rivalry between the two nations. The crowd had grown to almost 50,000 at the same venue when Australia played New Zealand in 1907. As popular as Rugby had become, it would soon feel the impact of the breakaway professional game of Rugby League, which was formed in 1908. That same year the first Australian representative team, the first Wallabies, went on tour. Sailing on the steamship 'Omrah', the team spent 9 months touring the United Kingdom, Ireland and North America. Of the players, their ages ranged from 20 to 27 years old, height from 5'5" to 6'1"(only 1 player was over 6") and weight from 10 stone to 14 stone. Following on the heels of a tour by the New Zealand All Blacks, the Australian team was pressured to produce a war cry similar to the Maori Haka. The team were ordered to perform an Aboriginal war cry, but were embarrassed by it. The Australian Captain Herbert 'Paddy' Moran called it the first Wallabies gravest affliction. Right: Wallabies 1908 pre-match war-cry. From John Corbett Davis Collection - courtesy State Library of NSW. The 1908 tour coincided with the London Olympic Games in which Rugby Union was a sport. Invited to play, the Australian team won the gold medal by defeating Cornwall, the Champion English team representing England. When the team returned home, eleven of its members were enticed by the money offered to join the newly formed Rugby League. The last test before the start of World War I was played against New Zealand in July 1914, but the war had a devastating effect on Rugby Union in Australia. With so many young players enlisting to fight, the Rugby competition all but closed down in New South Wales and did so in Queensland where it did not commence again until 1928. During the 1920's the only representative teams available for the international competition were the New South Wales Waratahs. The most famous of these teams was the 1927/28 Waratahs who toured the United Kingdom, France and North America, introducing a style of open, running Rugby never seen before, but which has been the stamp of the Australian game ever since. Because the New South Wales teams were representing Australia, they have retrospectively been accorded Wallaby status. In 1931, the then Governor General of New Zealand, Lord Bledisloe donated a Rugby trophy to foster sporting ties between Australia and New Zealand. Bearing his name, the Bledisloe Cup was established. Apart from the Rugby World Cup, of all the trophies contested, the Bledisloe Cup is the one that has the biggest grip on the imagination of the Australian and New Zealand Rugby public. Until 1947, New South Wales, as the senior union, was responsible for the administration of all incoming and outgoing tours and for representing Australia on the International Rugby Board. However, in that year the various State Unions agreed that the future of Rugby Union in Australia would be better served by forming one administrative body. Added impetus came in 1948 when the International Board invited Australia specifically (rather than a New South Wales representative), to take a seat on the Board. The inaugural meeting of the Australian Rugby Football Union was held on November 25th, 1949 with 11 delegates from New South Wales, Queensland, South Australia, Western Australia, Tasmania and Victoria. Sir Leslie Herron, the President of New South Wales Rugby Union was a guiding hand in the formation of the Australian Rugby Football Union and overseeing activity through his role as chairman. The Australian Capital Territory became a member in 1972 and the Northern Territory an associate member in 1978. In 1985 the Australian Rugby Football Union was incorporated as a company and in 1997, it became simply The Australian Rugby Union Ltd. After a slump in the fortunes of Australian Rugby, in the early 1970s, an in depth survey of the past, present and future Rugby Union was carried out, resulting in a re-appraisal of coaching Rugby World Cup techniques and a restructuring of the administration. In 1987, following an idea first floated by Australia and New Zealand, the inaugural Rugby World Cup competition was held in both those countries. The 1987 final of this four yearly competition was won by New Zealand on home soil. In 1995, South Africa also won on home soil. Australia hosted the Rugby World Cup in 2003 and has won the Webb Ellis trophy twice, in 1991 and 1999. In 2000 Australian Rugby Union had a full trophy cabinet containing every international trophy contested. 2003 was an historic year when we hosted the fifth Rugby World Cup and celebrated our past with the Centenary of Test matches between Australia and New Zealand. The 2015 Rugby World Cup is scheduled to be the eighth Rugby World Cup, the quadrennial rugby union world championship. The tournament is scheduled to be hosted by England from 18 September to 31 October 2015. Twickenham Stadium will host the final. Public reaction to women playing contact sports could be contemptuous, or even violent. In 1881, when two teams played a number of exhibition "football" games in Scotland and northern England, several games had to be abandoned due to rioting in or around the grounds. Whether this was the case will never be known. However, a series of sporting cigarette cards, published 1895 in the Liverpool, includes an image of a woman apparently playing what looks like rugby in kit very similar to that described in reports of the 1881 team (see right). It is possible that these "exhibition" games similar to those in 1881 continued with no press reporting, or the pictures may have been reprints for earlier illustrations inspired by the 1881 games. Some girls played the game unofficially as part of their school teams — and the earliest confirmed record of any female definitely playing rugby at any level anywhere in the world comes from a school game at Portora Royal School in Enniskillen, Ireland. Emily Valentine's brothers were responsible for the formation of the school's first rugby team in c1884. Emily practised with the team and in c1887 she played for the school, scoring a try. The first documented evidence of an attempt to form a purely women's team is from 1891 when a tour of New Zealand by a team of female rugby players was cancelled due to a public outcry. There are also early reports of women’s rugby union being played in France (1903) and England (1913) but in both cases the game was largely behind closed doors. During the First World War some women's charity games were organised, the most well documented taking place at Cardiff Arms Park on 16 December 1917, when Cardiff Ladies beat Newport Ladies 6–0. Maria Eley played full-back for Cardiff and went on to become probably the oldest women's rugby player before she died in Cardiff in 2007 at the age of 106. Interestingly the Cardiff team (who all worked for Hancocks a local brewery) all wore protective headgear, which predates their male counterparts by decades. In Sydney 1921 saw two women's teams play a game of rugby league in front a crowd of 30,000 —a photograph appeared in The Times in 1922—but pressure from authorities ensured that they did not play again. Rugbyfest pointed the way to the next big leap forward—the first women's rugby world cup, which took place in Wales the following year. Timed to coincide with the second men's world cup being held in England it did not meet with official approval from the IRB. The competing teams were New Zealand, Wales, USA, England, France, Canada, Sweden, USSR, Japan, Spain, Italy, and the Netherlands. The competition was run on a shoestring. Russian players sold souvenirs before and during matches to raise funds to cover their expenses, while four England administrators re-mortgaged their houses to cover the expenses of attending the competition. But after fifteen matches the first world champions were crowned—the USA, who beat England in the final. Despite the lack of support, and very little media coverage, the competition was a success, and the women's game continued to grow. 1998 The 1998 version of the Women's Rugby World Cup is the first to be fully sanctioned by the International Rugby Board. Women's rugby sevens has been dominated by New Zealand, with either the New Zealand team (1999–2001) or the Aotearoa Maori team (playing as New Zealand) winning the annual Hong Kong Sevens tournament from 1997 until 2007. The United States won the Hong Kong Sevens in 2008 by defeating Canada in the final (New Zealand failed to send a team). The inaugural Women’s Rugby World Cup Sevens tournament took place in Dubai together with the men’s tournament during the first weekend of March 2009. England defeated Canada 12–0 in the Bowl final while Australia edged New Zealand 15–10 in extra-time to become the first to win the Women's Rugby World Cup. Women's rugby sevens was included in the IRB's successful bid to reintroduce rugby to the Olympics in 2016. It is also bidding for Women's Seven's inclusion in the Commonwealth Games of 2018. At the 2014 Nanjing Youth Olympics the Australian Women's rugby Sevens created history by winning the Gold Medal. National Women’s Head Coach Tim Walsh said: “This is a historic day for Women’s Rugby Sevens in Australia and a window into the future of this sport. The talent and potential in this country is huge and the performance from these girls is both inspiring and proof of that fact. The preparation for this tournament shows the character of the program and the dedication from all its members. Toowoomba’s Dom du Toit scored a stunning hat-trick for the green and gold with the North Americans unable to handle her searing pace. Tayla Stanford, skipper Tiana Penitani and Marioulla Belessis each crossed over to touch down and hand Australia a richly-deserved win. Walsh praised his players that ended their first Olympic journey with an incredible seven wins out of seven in Nanjing, scoring over 200 points in the process. Courtesy Austrralian Rugby Union Media Unit. 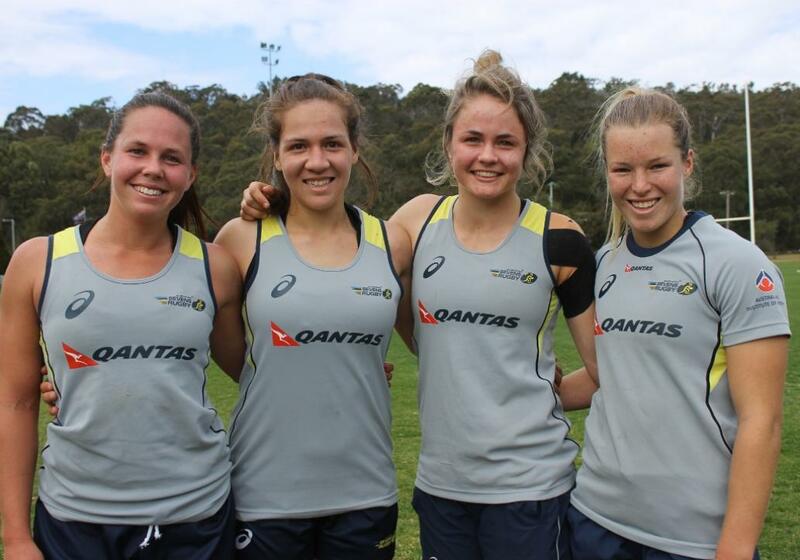 Australian Women's Rugby Sevens Team have won an historic gold medal on Day 4 at the 2014 Youth Olympic Games in Nanjing, China. The 1st Youth Olympic Games Rugby Sevens GOLD MEDAL belongs to AUSTRALIA! Aussies def Canada 38-10 - August 20th, 2014 - Image Courtesy ARU Media Unit. 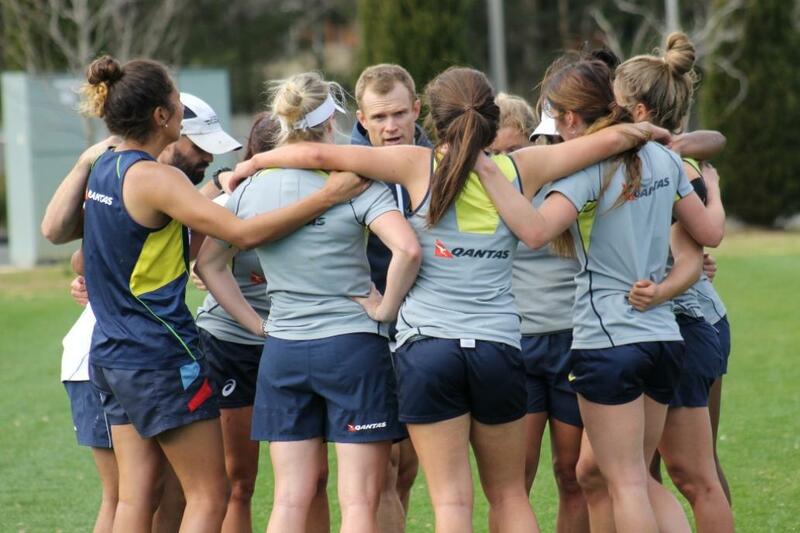 Report and QANTAS Australian Women's Sevens training images by A J Guesdon, 2014.